Here are two terrific resources online for charting text for counted thread techniques (cross stitch, back stitch, blackwork, canvas work, etc.) and for calculating fabric needs when setting up a new project. 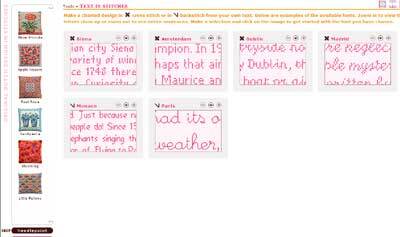 The first resource is Crosstitch.com’s “Fontform,” where you can chart your own text in 21 different fonts, and print the chart from the generated PDF. All you have to do is select your font, the width of the piece in stitches, and the color, then type in your text, check off whether you want it centered or not, and then preview and get the chart. It’s that simple! Here’s my test run. I’m thinking this tool would be Particularly Handy for card-making and embroidery on perforated paper! 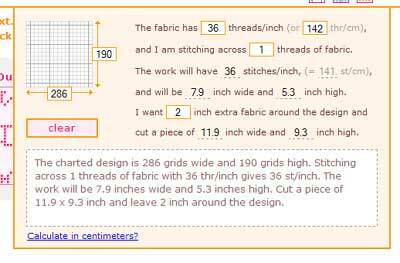 There’s also a handy stitch calculator available on the same page. The second resource is similar: Stitchpoint offers another text-charting program, but the format is different. 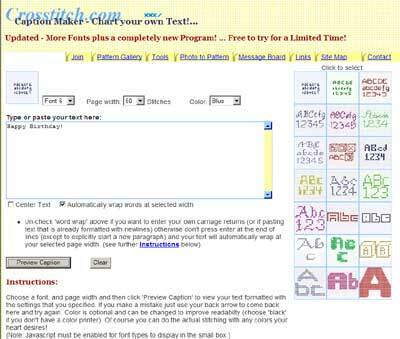 There are six fonts to choose from, four cross stitch and two backstitch. After selecting the font, you use the “keyboard” on the screen to select your text, then hit print. The image prints straight to your printer. What I really like about the Stitchpoint page is their little fabric calculator. Up in the right-hand corner of the page, you’ll see three icons. The first one is a handy-dandy stitch calculator that tells you precisely what size to cut your fabric, taking into consideration the threads per inch (or centimeter – you can calculate it either way), the number of threads you are stitching over, the number of vertical and horizontal threads in the design, and the number of inches extra you want around the finished embroidery. Very handy, indeed! So, if you’re looking for a way to chart some simple text for your next project, check out both of these resources! Thanks, Judith, for pointing these out! April 2, 2009 The French Needle – Embroidery Kits & Supplies, and a Special Discount! Thank you!!! It can be tedious to do this stuff by hand on graph paper. I've never seen these resources before. Many thanks! 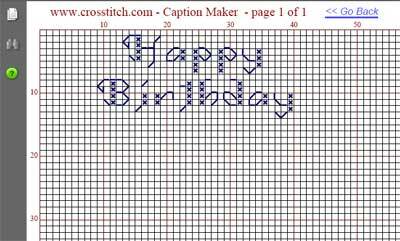 fyi… cyberstitchers.com has a graph paper tool that allows you to "create custom graph paper that has a picture of your choice displayed behind the grid making it easier to create custom patterns". I know you don't do much cross stitch but it could come in handy. Just bought the $12.00 a year membership to Crossstitch.com. Been searching for days for a font generator & considering I purchased a cross-stitch program that can’t do this, is a little annoying. Oh well. Why didn’t I just go to your site, straight away. We’ll never know. Thank God for you.